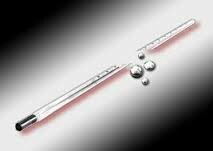 EHS requests that labs keep track of where mercury thermometers are being used and they are in good condition. Special care should be taken with those used in equipment such as vacuum ovens. Several incidents have occurred that involved a thermometer used inside of such equipment and it was not known that the thermometer was broken. We ask that labs take special precautions when using these items or, if possible, have EHS remove them as hazardous waste and then labs can replace them with non-mercury containing equipment.